TRSH1KIT H1 HID kit. Must list desired bulb color. TRSH3Ckit H3C HID kit. Must list desired bulb color. TRSH7KIT H7 HID kit. Must list desired bulb color. TRSH8KIT H8 HID kit. Must list desired bulb color. TRSH9KIT H9 HID kit. Must list desired bulb color. TRSH10-9145KIT H10/9145 HID kit. Must list desired bulb color. TRSH11KIT H11 HID kit. Must list desired bulb color. TRS5202-H16KIT 5202/H16 HID kit. Must list desired bulb color. TRS880KIT 880 HID kit. Must list desired bulb color. TRS9005KIT 9005 HID kit. Must list desired bulb color. TRS9006KIT 9006 HID kit. Must list desired bulb color. TRSH9012KIT 9012 HID kit. Must list desired bulb color. TRSH9003-H4KIT 9003/H4 HID kit. Must list desired bulb color. TRSH9004-9007KIT 9004/9007 HID kit. Must list desired bulb color. TRSH9008--H13KIT 9008/H13 HID kit. Must list desired bulb color. TRSD2HKIT D2H HID kit. Must list desired bulb color. TRSD2SKIT D2S HID kit. Must list desired bulb color. 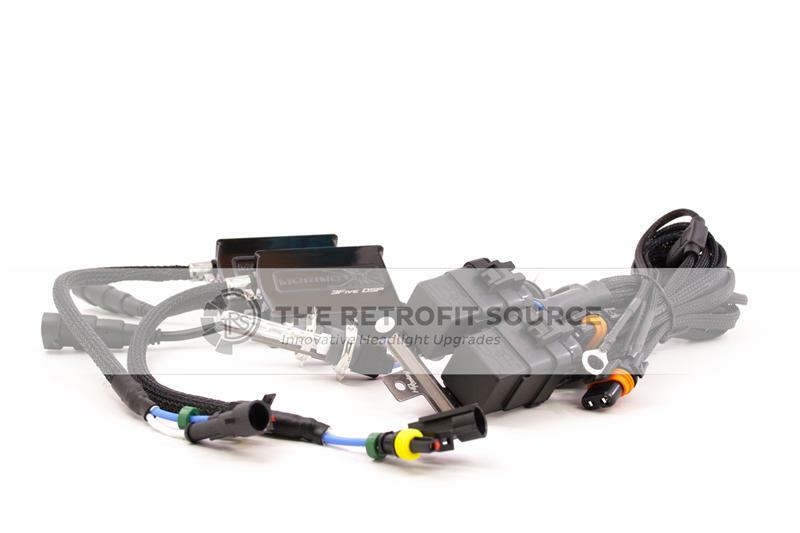 Since their debut in 2011, the Morimoto Elite Systems have earned their reputation amongst many as the aftermarket’s best HID kit. We urge you to check out their spec’s below, Read the Reviews, Google “Morimoto Elite”, and then decide for yourself. We’re sure proud of it! The ‘Moto ballasts feature: Compact, clutter-free design with integrated igniters. Completely weatherproof body & potted internals. Braided tech-flex insulated high voltage line enhances durability and looks, the interior lining prevents EMI interference. Laser etched graphics, aluminum fittings & mounting hardware. “DSP” (Digital Signal Processing) and 23KV Siemens Igniter greatly enhances bulb warm-up speed, now comes standard as of January 2014. Let’s not forget the 5-year warranty on the entire kit (3-year on a 5Five kit). The Morimoto Elite system is designed to run for 2500 hours, so that’s what it’s guaranteed for. Don’t let vendors with their BS “lifetime” warranties fool you into thinking you’re buying something well-made with that lame excuse. (no HID’s will last you a lifetime, and if you think that company will be around forever anyways let alone pick up the phone when you have a problem, think again).